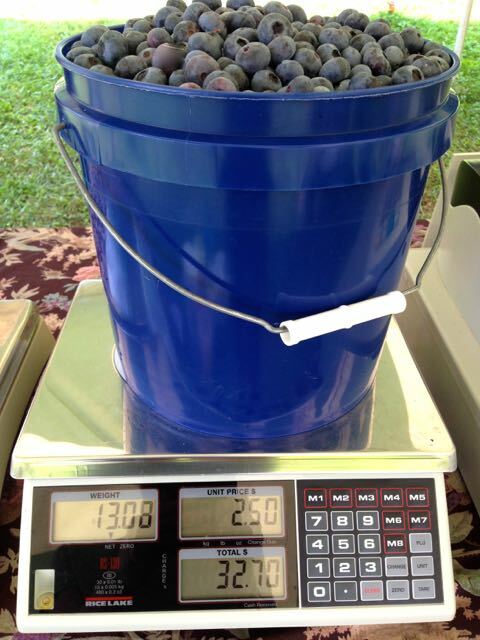 Thirteen pounds of blueberries in a two-gallon bucket – from one of our outstanding pickers! Join us this week for some pre-July 4th picking! Open Monday through Saturday, 7:00 a.m. to 12:00 noon each day, unless we need to close for ripening. Closed Sunday. Special blueberry “Happy Hour” this Thursday (6/30) – an evening pick from 5:00 p.m. to 7:00 p.m.
Will post any schedule changes here, also on facebook page, and phone message.